reveal the nature in the microscopic world last 90 years. doesn’t automatically mean that Bohr is correct. proposed the word free will . appears by the interference between elementary particles. coated on a wafer like a coral reef, named quantum corral. but other interpretation is possible. molecule, atom etc. follows the Pauli exclusion principle. wave nature is different for Fermion and Boson. 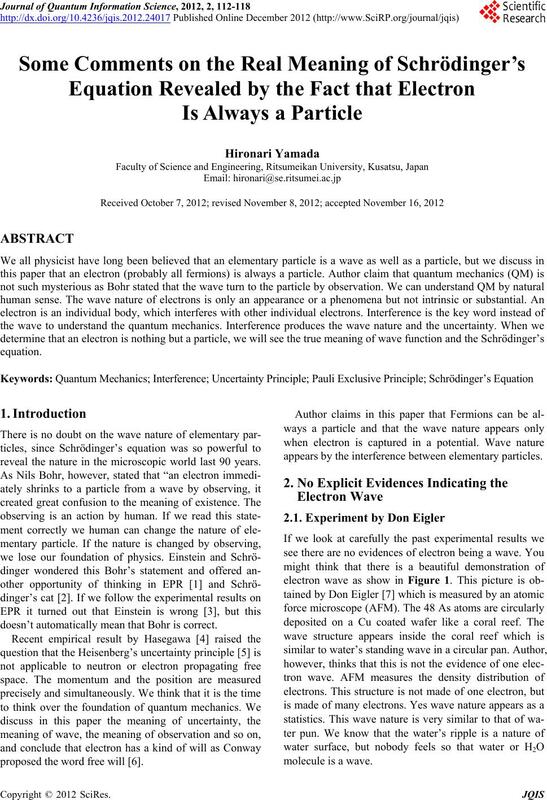 classical concept, since it is always a particle or wave. because the energy is high, and the wavelength is short? like atom, which is solved by the Schrödinger’s equation.   as well known. are indeed the intrinsic quantum mechanical uncertainty. Then we answer to the double slit problem . regardless of electron, neutron or photon. 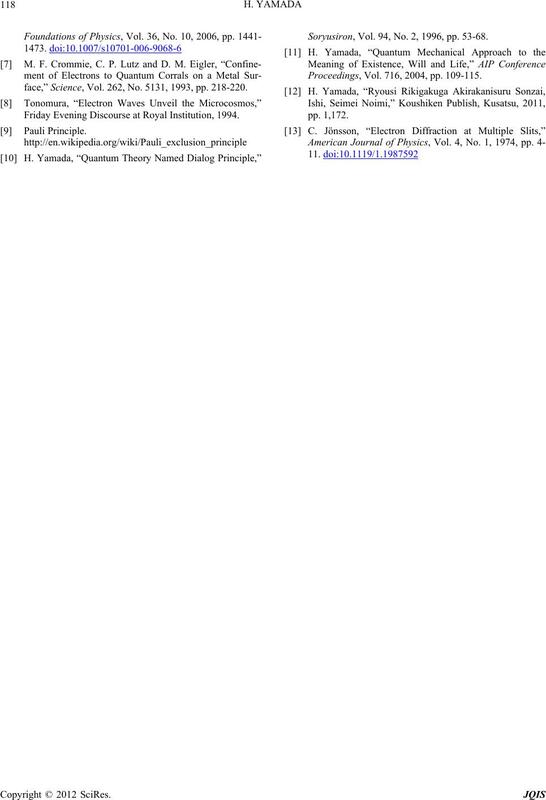 See Figure 3.
to follow regulations of societies. meaning of the Schrödinger’s equation in Section 5.
which slit has electron passed. phenomenon. We know the wave function how it spread. tion spread all over the universe. tern on the imaging device. ference, which is used for the relation between humans. ferent from the case that the double slits are recognized. ferent for Fermions and Bosons. ture. It is a sum of the reflections from all other particles. of one electron is defined by other electrons surrounding. also applicable to the microscopic world. extremely slow manner as we human can’t recognize. humans as well as massive electrons. 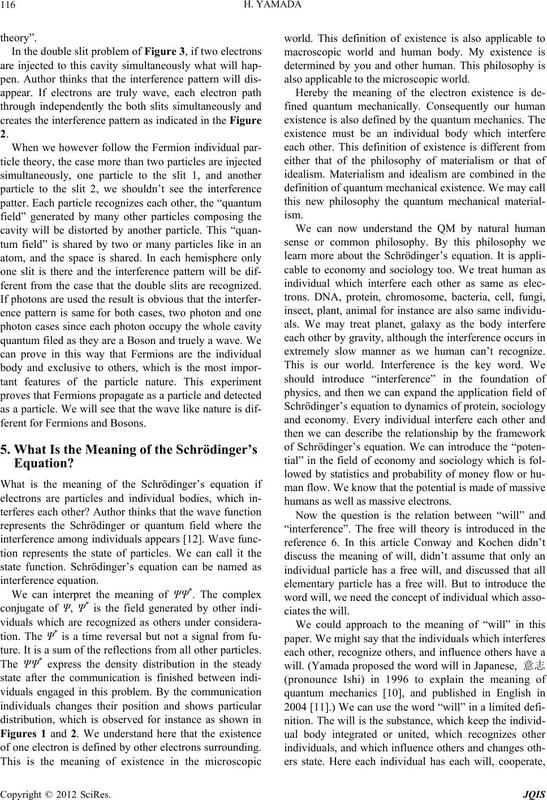 quantum field or Schrödinger’s field. which particles interfere and communicate each other. 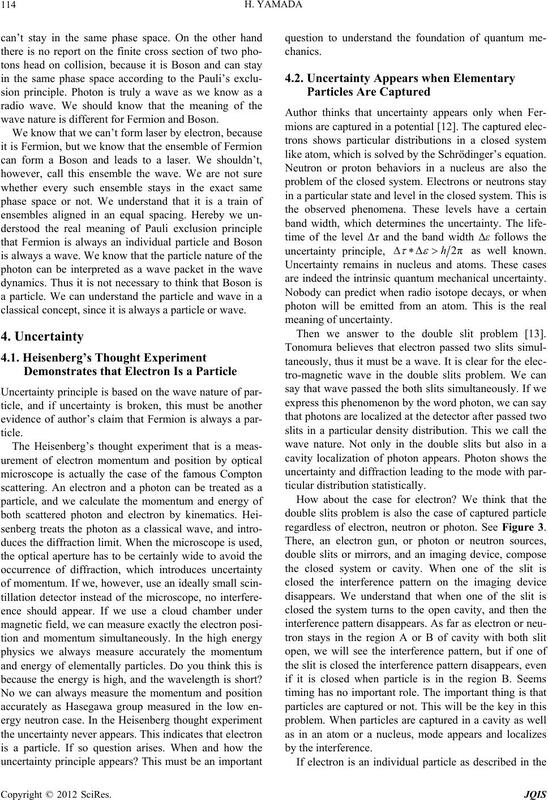 We don’t need to assume that Fermions itself are wave. ing individuals interfering each other. the fact that electron is always a particle. photons can merge each other since it is a wave or field. 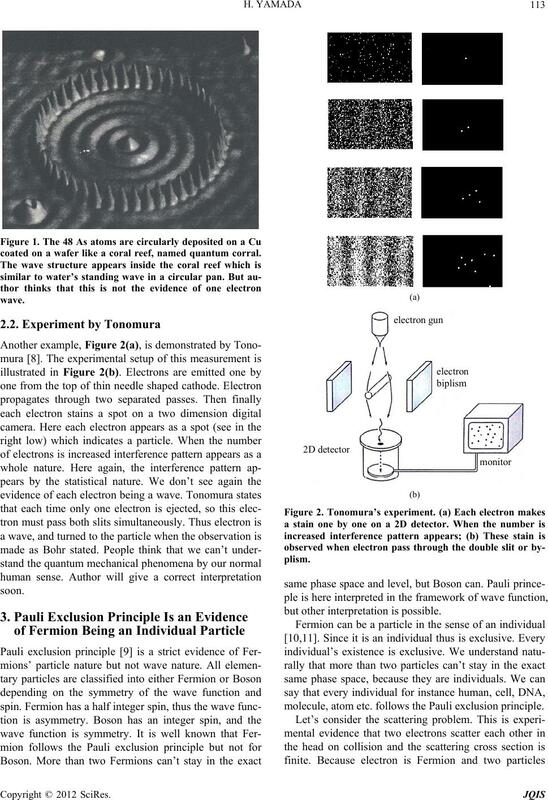 feres with particle composing the cavity or potential. include the Fermion in the category of such individuals. defines how interference appears among individuals. are in a category to be solved by QM. 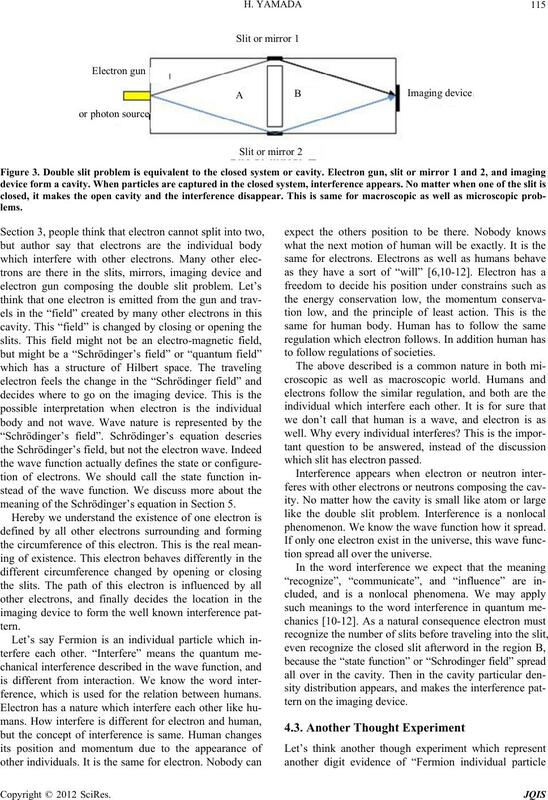 ing of existence is same for electrons as well as human. human society and living specimens. 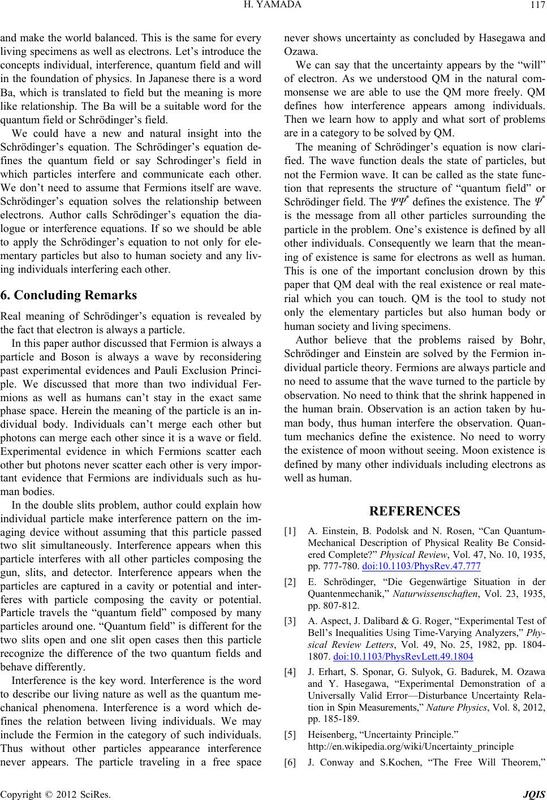 face,” Science, Vol. 262, No. 5131, 1993, pp. 218-220. Friday Evening Discourse at Royal Institution, 1994. Soryusiron, Vol. 94, No. 2, 1996, pp. 53-68. Proceedings, Vol. 716, 2004, pp. 109-115.